Random Acts of Amy, the contributor behind Friday Instagram Finds, will be a vendor at Urban Farmgirl's Main Street Market at Midway Village in Rockford, IL on Saturday June 13th! She (and her husband) will have a wide range of hand embroidered items in a variety of sizes, pillows, reclaimed wood signs, decals, and more. This is a one day event with over 120 of the best vintage and handmade vendors. Last year's inaugural event brought vendors and shoppers from all over the U.S., and this year's market is expected to be even bigger! There will be food truck, live music, and shopping, shopping, shopping! Preorder tickets, and find out more at the Main Street Market website. If you're not able to make it to the June Market, don't worry! There's a second Main Street Market added this year on Saturday, September 12th, and Random Acts of Amy will be at that one, too!! If you live anywhere near Rockford, which is about 90 miles northwest of Chicago, 70 miles southeast of Madison, and 90 miles southeast of Dubuque, IA, she hopes you'll stop by her booth and introduce yourself as a Feeling Stitchy reader. Sarah Benea creates gorgeous hand embroidered pieces! Her lines of sign language and constellation mini hoop necklaces are clever and beautiful. The detail on these mini hoops is mind boggling! She's the kind of artist who, when you see her work, it makes you want to push yourself to go beyond what you think your limits are. Here is her Sign Language Monogram line. Any stitcher worth her/his salt knows how difficult it can be to embroider hands (and eyes) and also make them look real. Well! Sarah has done that in spades, and has created a unique piece of jewelry, to boot. And here is her Constellation line. The navy blue background is the perfect "night sky" backdrop to Sarah's precise lines and French knots. I'm a Libra, what's your sign? Sarah also creates whimsical and timely pop culture art like this Miley Cyrus! Her attention to detail (wrist tattoo) and shading (check out her tongue) bring a strong visual appeal. Sarah also thinks outside the hoop and fabric with pieces like the one below that she hand embroidered on a vintage map. 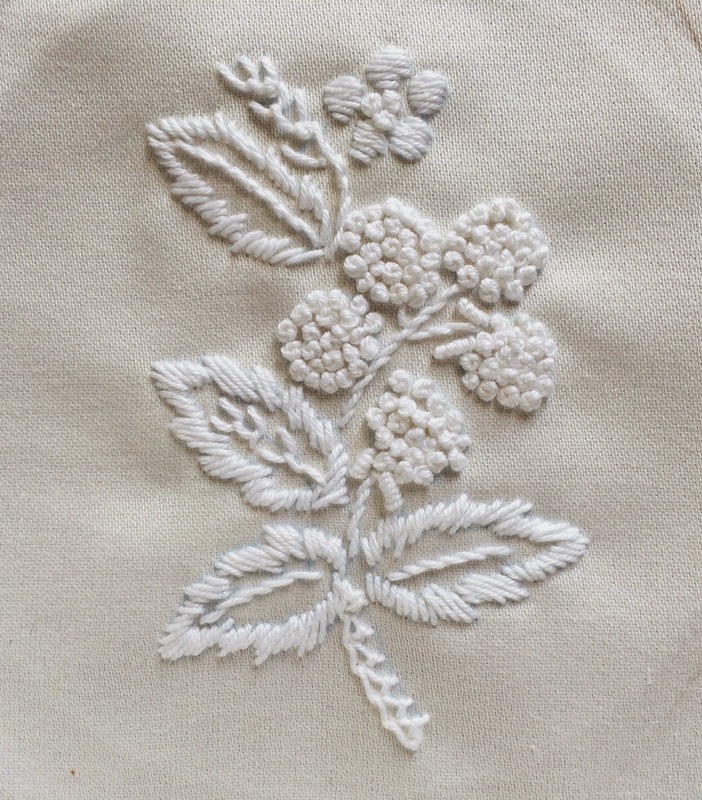 Embroidering on paper can get tricky, and once again, Sarah's attention to detail takes her artwork to the next level. I hope you've enjoyed this edition of Friday Instagram Finds (FIF) on Feeling Stitchy, which is now brought to you weekly! Please leave comments below to let me know what you thought. If you'd like to be considered for FIF, or if you find a great embroiderer or stitch-related needle worker who you think I should feature, be sure to tag their pictures with #feelingstitchyig, and I'll take a look! While you're on Instagram, make sure you follow Feeling Stitchy! We're @feelingstitchyish. We'd love for you to stop by and say hello. But wait, there's more! I discover this adorable Instagram feed called Penguin the Magpie, and I have to share it with you. From Penguin's IG bio: Rescued by Noah as a baby and raised by us. Free to fly but loves our home as much as we do. Is known to occasionally sneak in on wet nights. Female. 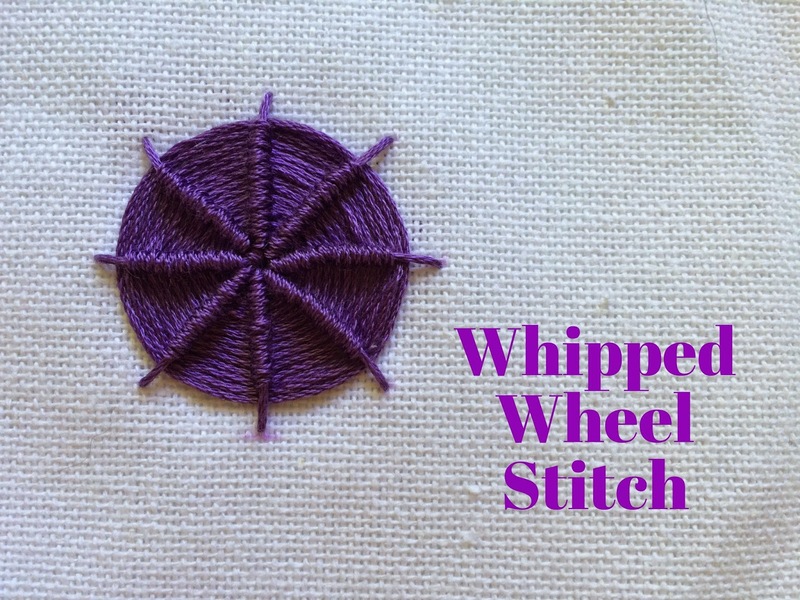 The whipped wheel is a stitch I learned from the Take a Stitch Tuesday Challenge. I really like how it looks and it's fun to stitch. 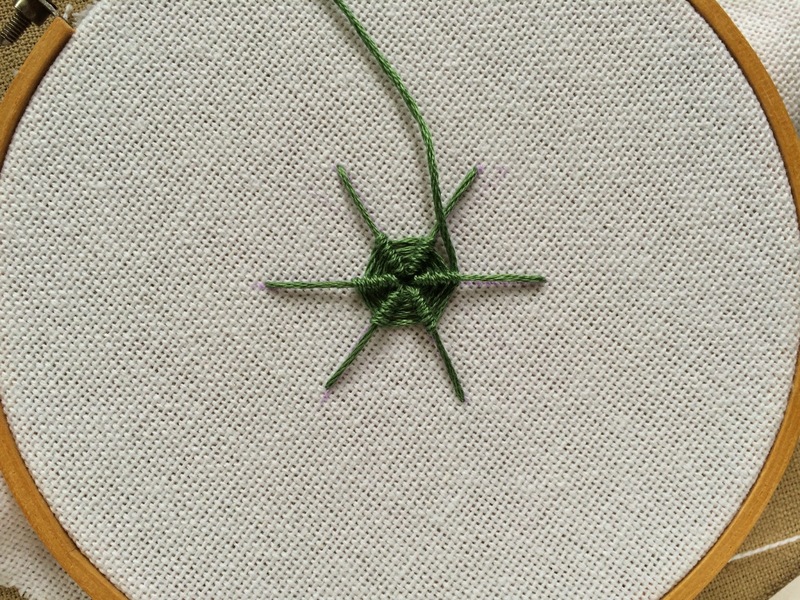 I have also seen it referred to as the whipped spider wheel or ribbed spider web stitch. So grab your tapestry needle and let's get started! I traced a circle using a template and drew 8 spokes towards the center of the circle. You can stitch this with as many spokes as you like. Straight stitch each spoke towards the center. Bring your needle up through the center. Slide your needle under the first spoke. Then whip (or backstitch) around the spoke. Do not pluck the needle into the fabric. This is where the tapestry needle works best because it has a blunt tip and will be easier to weave under and over the spokes! Move onto the next spoke - slide your needle under it, and whip around. Repeat the steps around and around - whipping each spoke before moving onto the next until you fill the entire wheel! This is where I stopped whipping and just pulled the thread under each spoke a few times around and ended my wheel. You will see I did not whip all the way to the ends of each spoke - I left a little bit of the spokes sticking out - but you can whip all the way to the ends of the spokes if you like. My second whipped wheel I worked 5 spokes with green floss. This time I did not trace a circle - only the spokes. 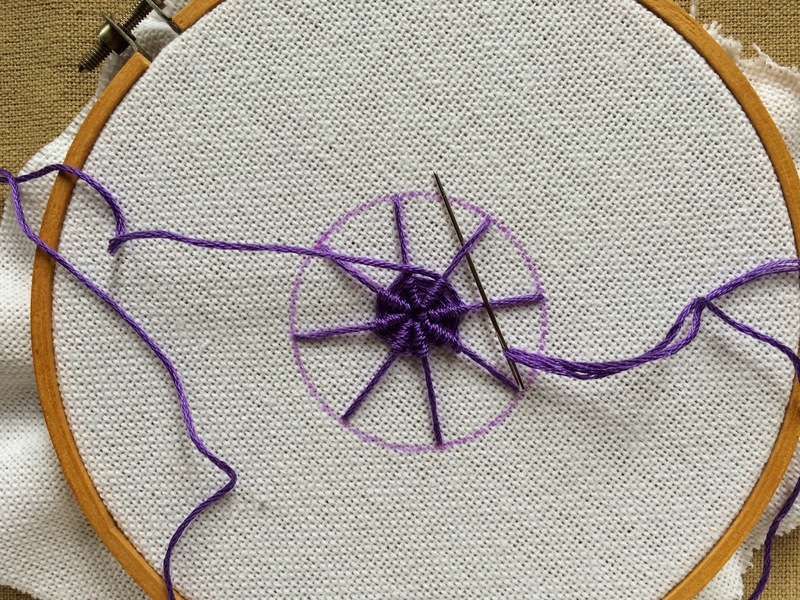 Try out the whipped wheel stitch and share your photos in the Embroidery Group on Flickr! According to the Danish Fashion Institute's study in 2013, Fashion is the second most polluting industry after oil. Big fashion designers and individuals are pushing for a more ethical and sustainable industry and the new Fashion Revolution Day promotes this movement. Fast fashion is likened to 'junk food' and consumers are urged to seek out a more ethical product and 'up-cycle' old clothes as well as acquiring new skills to make their own. The addition of a monogram gives an item a unique touch which seems to appeal to our increasing need for real worth and reflects a rejection of throwaway consumerism as Lizzi Walton, organizer of SITselect craft Festival explains. "In a world of bland mass production, to own something individual is enhancing. It’s a pleasure to have something that is made with love and made by hand. Sometimes to have less is better." This recent flow of consumers towards hand crafted and artisan products (often more ethically produced due to their nature) is a big reason for an increased popularity in monogramming as it gives a garment a refined bespoke finish and by doing so can allow it longevity, as it becomes part of the owner's capsule wardrobe. In the last couple of weeks I've decided to learn more about monogramming. I was kindly invited to join a weekend course at Hand & Lock where I picked up some of the essentials of this intricate technique. 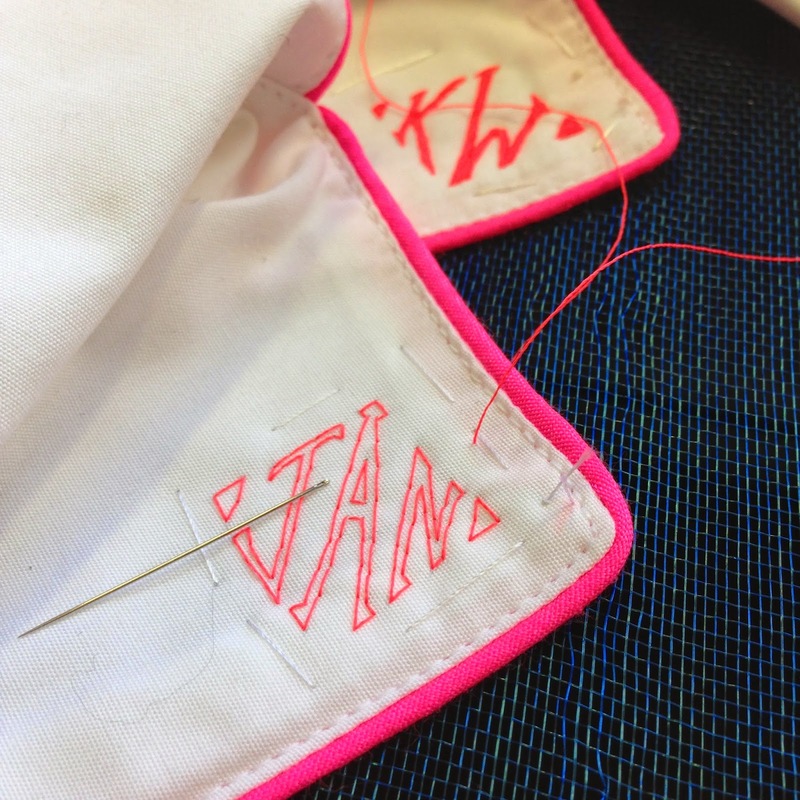 Monogramming work makes up a core element of the business at Hand & Lock, which has led me on a quest to discover what this type of embroidery entails and why it is so popular. We are all partial to a personalised item from mugs to stationary and linen to luggage. This type of customisation certainly befits fashion and has been trending in recent years. What was once an embellishment mainly adorned by the Savile Row society is now sought after by the many and is certainly a fashionable way to stand out from the crowd. Consumers are less interested in elaborate logos, so the appeal of a monogram also ties into our cyber world of acronyms and avatars and acts as a way to brand ourselves. Moreover it allows the buyer to get involved in the design process and gives them a greater attachment to the product. A constant stream of customers come to Hand & Lock to have their goods monogrammed. The house is renowned for its outstanding quality of hand embroidered work and they have also moved into the 21st century to offer machine embroidery at an affordable price, thus a wide range of orders are delivered. Clients can vary: a business tycoon requiring their shirt to be initialled, a mechanic ordering a well considered gift of a monogrammed shammy leather cloth for his co-worker or a lady wishing to personalise an heirloom for a wedding present. Typically it can take a professional embroiderer a few months to master the technique. Different guidelines are adopted to execute the variety of letters in the Latin alphabet and when an array of font styles are added to the mix then an additional set of rules are applied, making this embroidery work relatively complex. Hand & Lock have their own particular way of monogramming which ensures that all of the embroidery work that leaves the house is uniform and has exactly the same finish. Many businessmen initial their garments such as shirts, coats and ties. Surprisingly some will even have their socks and boxers labelled. Could this be a die hard habit that harks back to life at private and boarding schools? Traditionally these types of application of monogramming was reserved for wealthy gentlemen and dates back centuries. It is certainly a statement of status amongst peers and a way of adding a delicately customised finish to a bespoke garment. This could be the ultimate expression of luxury especially in men's fashion when compared to women's; where it's easier to add a personal touch to an outfit with a handbag or printed blouse, for example. For such a small and intricate embellishment there is a variety of customisations available and even an 'etiquette' of how initials should be combined. A larger edged font in a bold contrasting colour can have a very different effect to a soft script monogram subtly embroidered in the same colour silk as the garment. I've also discovered that often a monogram will be placed on a part of the clothing that is not visible to the public, such as by the hem of a shirt. Although this may seem frivolous in fact it demonstrates the growing trend in ownership of a one of a kind item. 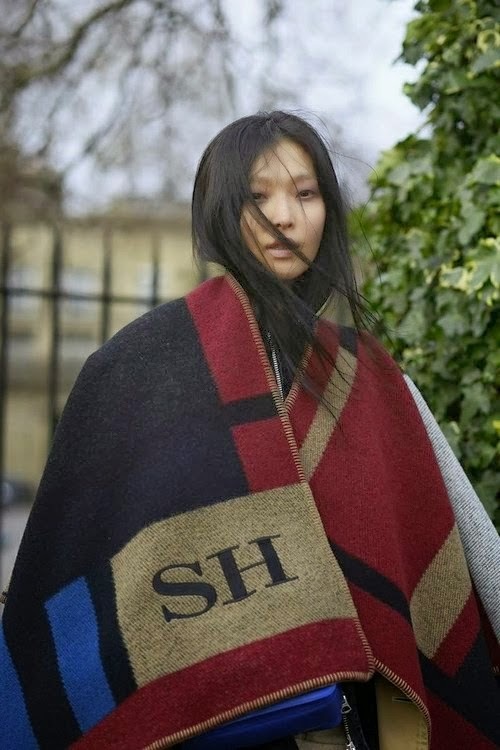 The monogram does not only have to be elaborate and act as a personal emblem. It can also be a discreet symbol of a well-loved garment that can make the owner feel special when wearing it. The customer's input in the creation of an item clearly initiates a greater connection between owner and product. By leaving their stamp on a product the owner gives it a form of identity which adds greatly to its purpose. This will become an increasingly, more important aspect of design in a diluted market that is dominated by over consumption. Hi, I'm Julia! 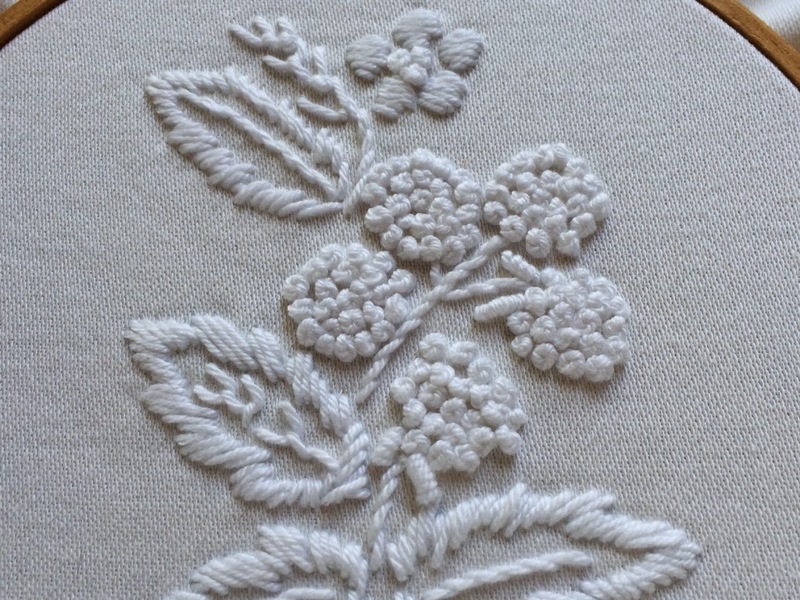 Based in Amsterdam, I am an embroidery enthusiast with a life long passion for textiles. I will be contributing during my work placement at the prestigious Hand and Lock a London based, embroidery and embellishment company with 250 years of heritage. Join me every other Friday for my Diary of an Intern posts! Summer reading lists are popping up everywhere as people anticipate the laid-back days that often come with warmer weather. As much as I enjoy technology, I'm still pretty old-school when it comes to books: there's just something about the weight of a book in your hand and the feel of paper on your fingers as you turn a page. I have a bad habit of dog-earing pages (even in library books--shhh! ), so maybe a new bookmark will start me on a new path. 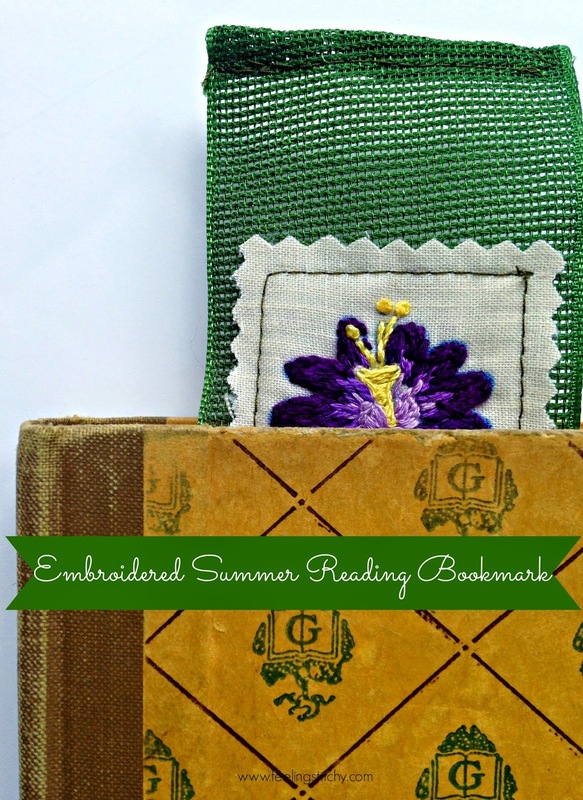 So, regardless of whether your summer (or winter) reading is required or purely for leisure, join me in creating an embroidered bookmark! Transfer and embroider the design on the 6" x 6" fabric square. Iron the interfacing to the backside of the embroidered design. If using the square template provided, cut out the inside of the square without cutting through any of the square's edges. 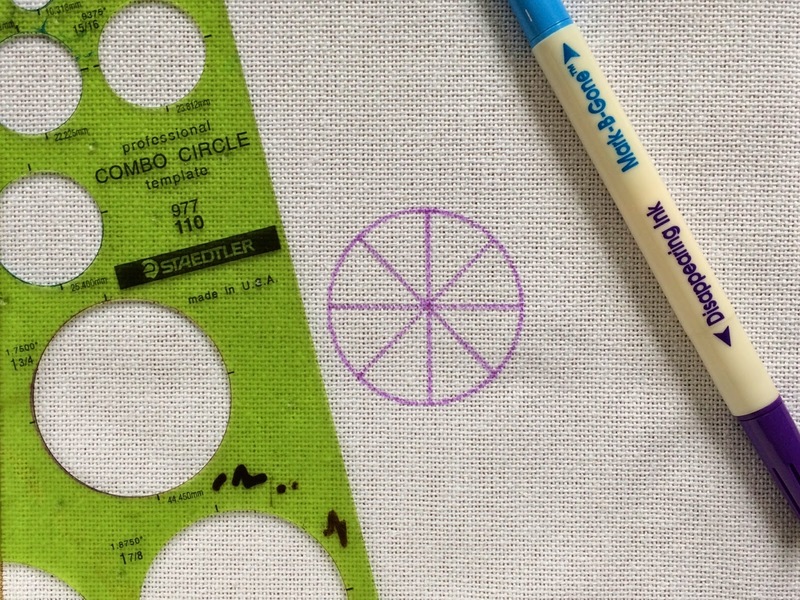 Center the resulting square hole over your embroidered design and trace a square around it with the water soluble fabric marker. Use pinking shears to cut out the design, following the square's outline. Fold the ends of the ribbon under twice--1/4" each time and sew in place. The open weave of my ribbon made stitching a little tricky. If your ribbon won't fray you can cut an inverted triangle at each end instead of stitching. Position the embroidered square wherever you would like on the ribbon and hand- or machine-stitch in place using a scant 1/8" seam allowance. Pop your finished bookmark in your latest read and head for the nearest beach, hammock, or hearth (for those in the Southern Hemisphere!). What's on your to-read list for this summer/winter? P.S. In two weeks I'll be back to kick off a stitch-along that will span June, July, and August; the end result will be a fun project to add to your autumn decor. See you then! Jessica and Hannah are co-owners of their Etsy shop, and are self described, "Hand Embroidery Artists/Goddesses", and I wholeheartedly concur with their assessment! Every time I see a finished custom portrait, my mouth just drops open in awe. You need to follow their feed to see the pictures their works are based on, and their works in progress. Like this amazing scene! This embroidery piece is based on a photograph, and it is absolutely fabulous!! The attention to detail that's put into each custom portrait is fascinating. Take the sand in this one, for instance. If you check out the in progress photos, you'll discover there's so much more than some tan floss stitched out for the sand. There's layering, and depth, and dimension. In addition to the custom pieces, they create pieces like this that stretch themselves creatively. The hand tinting used on the jar gives this hoop a bit of oomph that you wouldn't see in it otherwise. And the flowers are beautiful, and add another layer of dimension. Lindsay creates eye catching embroidery pieces with fantastic iconography and bright colors. I cannot even get over how incredibly clever this whole hoop is! This stand of trees is beautiful in its simplicity. And can you even believe the clever way she attached rope to the hoop for hanging?!? This is seriously the most unique way I've ever seen someone hang a hoop. The attention to detail in this buck portrait is amazing! I love the unexpected polka dot background and the roses in the buck's antlers. What can I even say about this bunny? Again, the attention to detail, and the way that Lindsay used lazy daisies to form the bunny is so unique and clever! Sachi creates exquisitely detailed pieces in both embroidery and cross stitch. Her stitches are so small and precise, and you can tell how much care she she puts into each piece. This is a fun piece she created for a restroom. That border looks like metallic floss, and, if you've ever worked with metallic floss, you know it can be pretty fickle! This piece makes me want to label each of the rooms in my house with a beautiful bit of embroidery. Sachi created this pretty bead embroidered collar for issue number 51 of Mollie Makes. The flower motif she created out of sequins and beads is absolutely dreamy. Sachi also makes tiny embroidered necklaces and pins using a mixture of embroidery and beading. Her work combines great colors and designs into a little space. 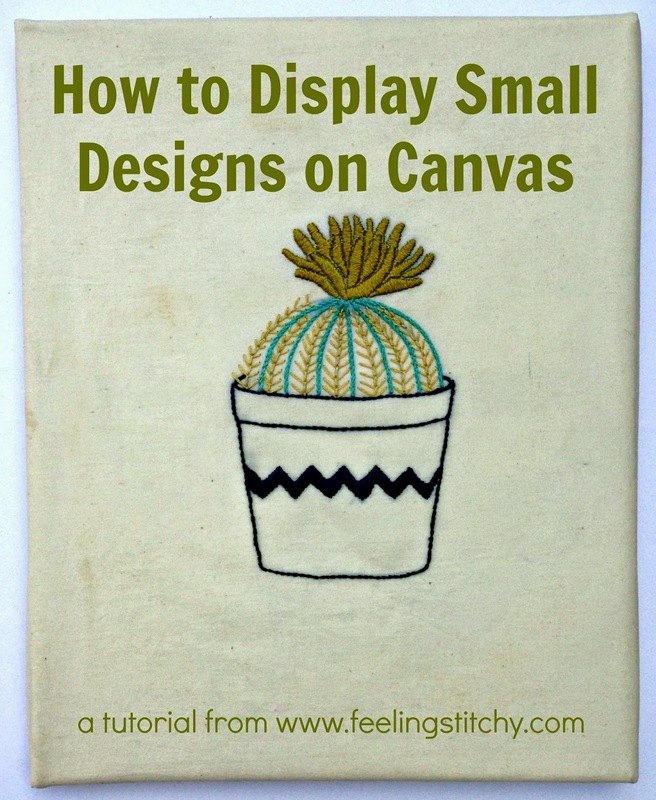 I hope you've enjoyed edition number five of Friday Instagram Finds (FIF) on Feeling Stitchy! Please leave comments below to let me know what you thought. If you'd like to be considered for FIF, or if you find a great embroiderer or stitch-related needle worker who you think I should feature, be sure to tag one of their pictures with #feelingstitchyig, and I'll take a look! Friday Instagram Finds, No. 6 will be published Friday, May 29, 2015. 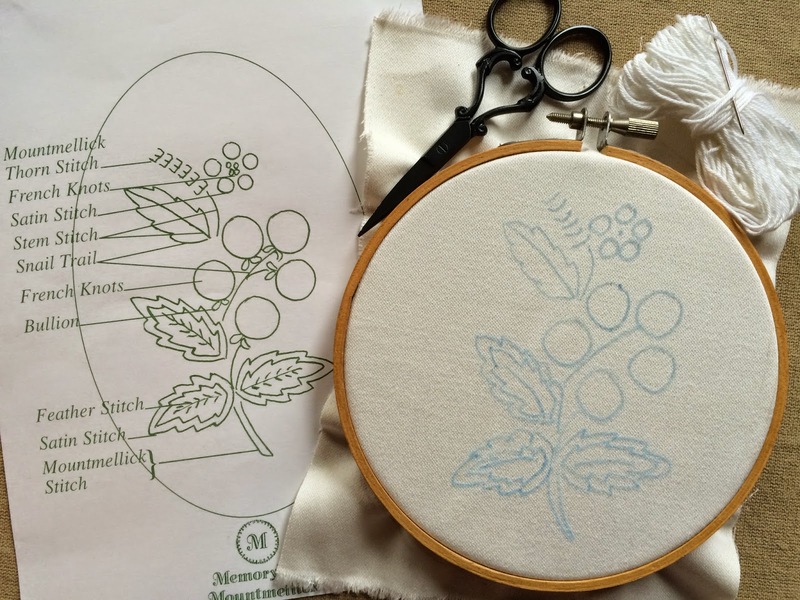 In my last post I told you about my visit to the Mountmellick Embroidery Museum in Ireland and I purchased a small embroidery kit at the museum to try stitching. 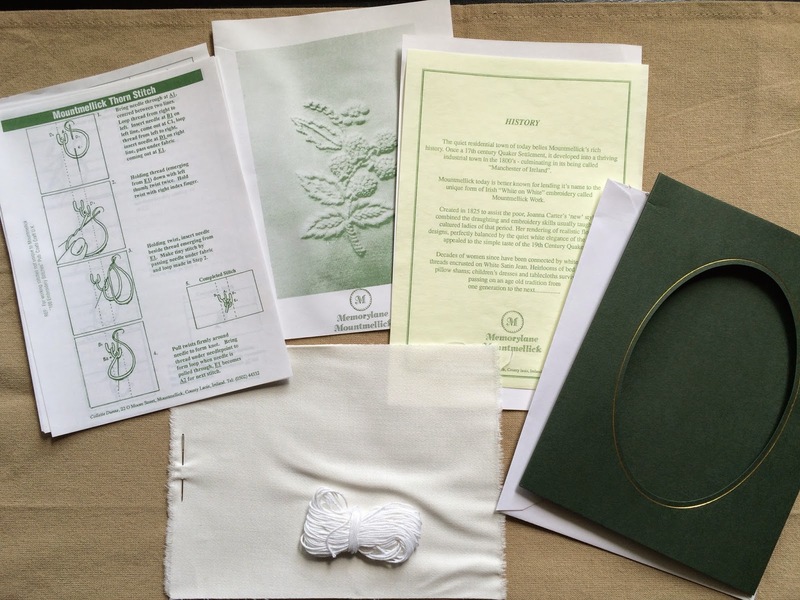 The kit included the satin jean fabric, needle, thread, pattern with stitch suggestions and stitch instructions - along with some history about Mountmellick embroidery. I used a washable blue pencil to roughly trace the pattern onto the fabric. The satin jean fabric is thicker than what I am used to - at first I felt as though it was tough to pull the needle and thread through the fabric - but I did get used to it after some stitching. Here it is all stitched. Next I followed the finishing instructions that came in the kit. 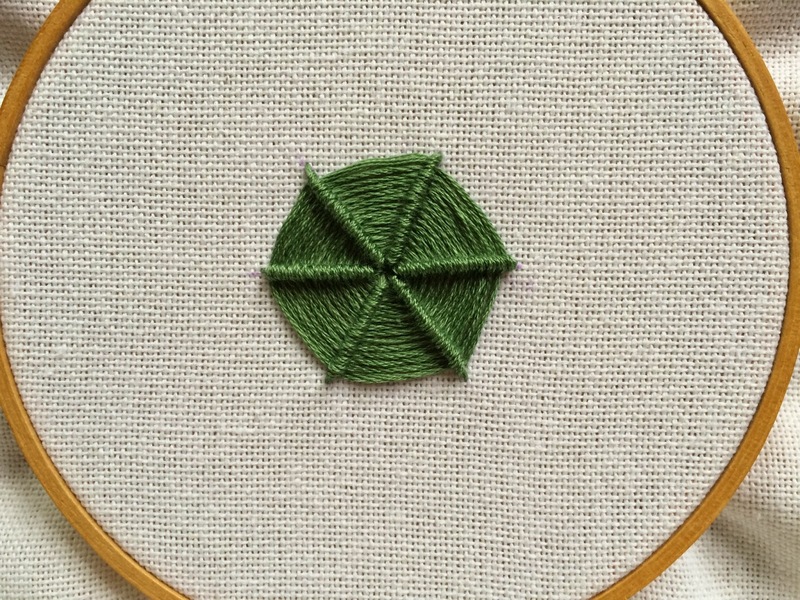 I was nervous about this step because I have never boiled my embroidery before. Honestly, I have never soaked to remove the pattern lines either!!! Usually I use a disappearing ink. But I didn't want to use the disappearing ink because I wasn't sure how long the stitching would take me. I soaked it in cold water with a drop of laundry detergent for a few hours. The instructions said overnight, but I could see the blue tracings were gone within a few hours. Next, I boiled it for about 20 minutes and let dry overnight. I looked at the instructions again and realized I didn't boil it with detergent! So I boiled again - this time with a drop of detergent for about 20 minutes and let dry overnight again.